Rakusan did not include the Fan Series in his main sequence numbering. Therefore, the original number used for each of the 36 Series prints has been modified to identify the Fan Series members of its theme. The five different fan silhouette shapes have been here assigned arbitrary numbers 1 through 5. To indicate a fan design these shape designations are added to the 36 Series number separated by a hyphen. In themes which contain duplicated fan shapes, one has been arbitrarily designated A and the other B. 105-1 indicates that this is a Fan Series design with fan shape 1 in the 105 Butterfly theme. Like all other designs in this series, 105-1 was only produced in a single print run, and few copies are currently documented. The composition of 105-1 includes a large swallowtail butterfly sitting on a leafless, thorny branch. The branch is essentially just a line drawing which looks equally well in the ishizuri version or in the original. 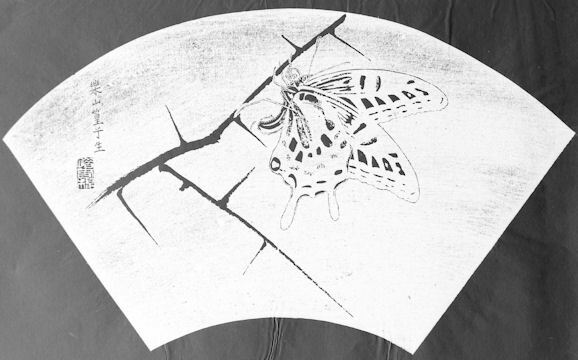 However, in the ishizuri version the very detailed line drawing of the butterfly shows the color pattern of its wings as it is in life, and in the computer reversed version they look decidedly peculiar. In this and a few other early drawings Rakusan used outlining to set apart elements whose ishizuri versions were at least in part the natural ones. 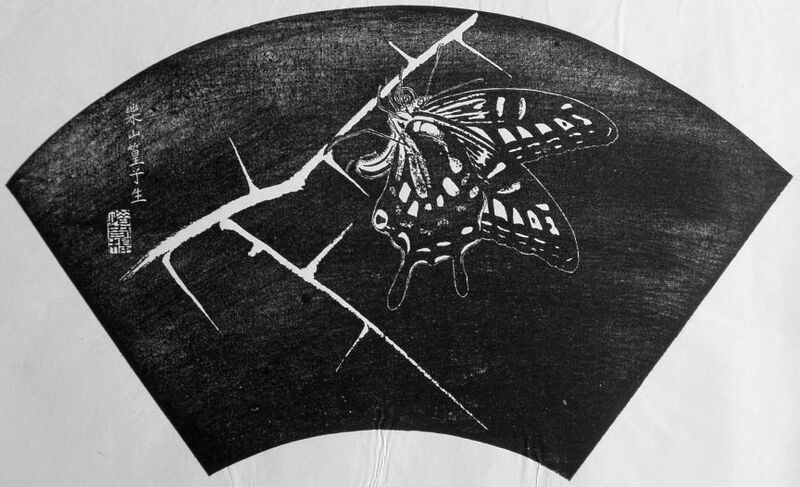 It is probable that the original sketch showed the butterfly in proper coloration, and the adjustments were made during carving. As a result 105-1 is one of several early designs where Rakusan struggled with his ishizuri techniques. Asian Swallowtail (Chinese Yellow Swallowtail), Papilio xuthus, (並)揚羽, (なみ)あげは, (ナミ)アゲハ, (nami-)ageha, '(common) swallowtail', is a native species in Japan. Rakusan used this species in 105-1, 105-3, and 105 in this theme; as well as in a rose design, 101-3B, (where it is non-thematic). Although just from a thorny branch species identification is difficult, it is very likely that the plant is intended to be a flowering quince. The three species of flowering quince are collectively known in Japanese as 木瓜, ぼけ, ボケ, boke, and in English informally as "Japanese Quince". Today the Japanese name is also used particularly for one of the most common garden varieties, Chaenomeles speciosa var. cf. lagenaria, a selection of an originally Chinese and Korean species early imported into Japan. There is also a shorter-growing native species, Chaenomeles japonica. These quinces have been bred into many forms for flower and fruit production and are often used in bonsai.